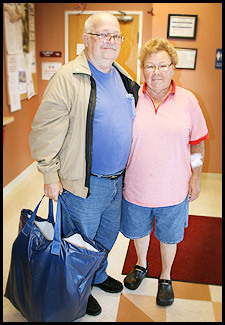 Ron and his wife, Bernadine, arrived at the facility before her 6 am appointment. 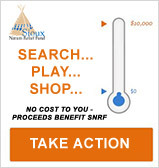 The Sioux Nation Relief Fund (SNRF) Program staff arrived at the Sharps Unit of the Dialysis Management group in the morning with their CROCS CARES representative, Melissa. In the waiting room, Ron sat and watched as the visitors set up for the shoe distribution for the clients of the facility. Ron and his wife, Bernadine, arrived at the facility before her 6 am appointment. They make the trip three times a week and are thankful for the proximity of the newer facility constructed in December 2010. It’s still 50 miles from their home and they typically wake up around 4am to get to the early morning appointments but that’s the type of devotion that has them approaching their 52nd wedding anniversary the week following the CROCS CARES distribution! Ron has been in many waiting rooms. When Bernadine was stricken with pneumonia and in an induced coma for 11 days, he stayed by her side. Not expected to walk, she was hospitalized for 41 days. So, receiving a new pair of walking shoes for his wife and having her walk out the door of the facility is extraordinary for this couple. As the patients exited into the waiting room, a green CROCS CARES banner greeted them with several staff on hand to help fit the shoes. 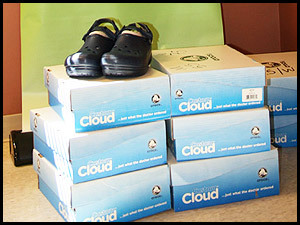 The Dialysis center is a fairly new Program Partner of SNRF’s Healthy Living service and getting CROCS shoes as a new partner was an extra special treat. As the patients exited from their morning dialysis into the waiting room, a large green CROCS CARES banner greeted them with several staff on hand to help fit the shoes. Given the health issues that this group has suffered, they did not lack humor as they were fitted for their shoes. Leona put her CROCS on and immediately kicked up her feet to show off her shoes. Leona says she feels so much better now that her kidneys are functioning with the help of dialysis. She’s even ready to come out of retirement and get a job again. Adele's grandson stopped to get her fitted for her CROCS before taking her to the car. Eight clients were fitted that morning. For the patients with later appointments, shoes in their sizes were left with the staff so every patient had a new pair to take with them!